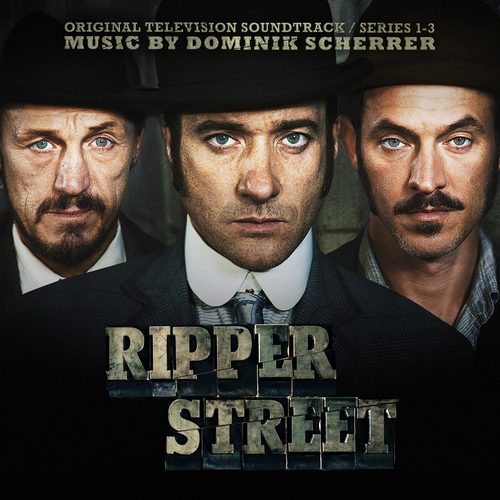 Bringing late 19th century Victorian Whitechapel to life with stunning historic sets and topline actors (Matthew Macfadyen, Jerome Flynn, MyAnna Buring), police drama Ripper Street was an immediate success on its TV debut in 2012. Despite being axed by the BBC after series two a Radio Times poll revealed it as Britain's most popular TV show of 2013 ahead of Doctor Who, Broadchurch and Breaking Bad. Taken up by Amazon Prime Instant Video the third series will make a terrestrial debut later this year. British Swiss composer Dominik Scherrer has an extensive list of TV and film composition credits that include Scenes Of A Sexual Nature, Inspector George Gently, Agatha Christie's Miss Marple and The Missing. His music perfectly conjures up the world of East London from over a century ago with its detailed collection of musical sounds that can range from a mandola to a Norwegian Hardanger fiddle. He received the ultimate accolade for any composer in 2014 when his score for Ripper Street won the much coveted Ivor Novello Award for Best Television Soundtrack.